Summertime is here! Well, the summer solstice isn’t until June however all three boys are officially out of school today! The 5-year-old finished last week (he was in Mother’s morning Out 4-year-old class) so he’s been home. I am now counting down the minutes until it arrives with awful great expectations. I am excited that we don’t have to engage in the daily early morning “wake up get ready” yelling discussions ( I engage in – they ignore). We can sleep in, especially since they are taking a season off from swim team (first time in a while). I am feeling ready, confident that we will have a good summer. O.K. I know I am supposed to cherish these boys, love the fact they will be home everyday, all day, with me, did I mention all day. I recognize that I have a limited amount of time with them and every homeschooling friend I have will pop me upside the head for feeling differently BUT I have to tell you my patience is running thin (notice they have yet to have one summer day here and already I feel this way)! This summer Insanity Sanity will be had by all. A 12-year-old, 10-year-old and 5-year-old boy will not defeat me. If they do, hubby can handle it. Who am I kidding?! We’re going down, but not without my plan. I have plans!!! Chores will be done, lots of time will be spent outside (by them not me) and at the pool and you better believe a good VBS camp will be found! I’ll be at the gym DAILY! A few trips here and there to go on and all will be well. That should wear them OUT! Phew! OK, that’s my plan, we can do this. Now, I feel better. I have vented and all will be well. My cool will be kept all summer long. My yoga mat beacons and I’ll have a good smoothie to follow right now. I have to get some yoga in right now because the hours are going by fast and they will be home SOON. The other night when my entire family decided to practice yoga together; I was very touched. It wasn’t a pre-planned event where I laid out mats and we had instructional time. It was spontaneous, challenging and fun. I felt love and warmth in my heart and soul for this bunch as they practiced Bakasasna (crow (crane) pose). I have been teaching yoga, weekly, for about 6 years now. I have really tried to not push yoga on anyone in the house. I do have my own practice, so, of course, throughout the years they have watched, participated and even inquired about it on their own. My two older boys have even taken classes that I have taught for kids. In yoga the boys giggle and enjoy it but are not serious yogis. My husband has back issues and visits the masseuse and chiropractor often. They always tell him to do more yoga and he tells, ‘them my wife teaches that”, and they just give him a crazy look and ask him why he doesn’t do more yoga. He then comes home and we will do some yoga. We do yoga every now and then, and I show show him things to do to help him out. We even do a little couple yoga now and then, but no consistent practice. So we aren’t the “yogi family”, or so I thought. Being with three boys and a man-child has makes us a football and baseball family. Now, don’t get me wrong my family knows the importance of a yoga practice especially with the type of sports they are engaged in but, they need a little prodding and I already nag about enough stuff (chores, homework, etc.). So imagine my delight when it hit me that my family is a “yogi family”. The reality hit me the other night when my oldest (11 yo) showed me he could do Bakasana. He struggled a bit and was getting frustrated so I then got on the floor and just talked him into being calm and focused and trying again. He began to look to me for more guidance so I then did Bakasana. He tried again and then hubby wondered if he could do it so he got onto the floor with us. He was so surprised and excited that he had the strength to do it! My middle son happened to walk in on us and jumped right in with confidence and an attitude of “let me show all of you how its done”. He dropped on the floor and did it with ease (he has always been able to do this). Now all four of us are on the floor practicing our Bakasana together and then trying to go into other asanas (postures) as well. The little one (5-year-old) even jumped in! The entire J5 (our family nickname) is all into it. I sat back and just watched and it hit me, I do have a “yogi family”! Look at my little brood, practicing together, finding their strength, being challenged, laughing, goading each other on to just try again, and just having fun doing what Momma does all of the time. All these years I didn’t need to nag, or push them into it, it just happened. I guess I do have some influence over these bodies filled with testosterone and they do see the value in what I do and how valuable it will be for them in their own personal journeys as well. I love kids. Having three boys helps me realize that daily. Now, don’t get me wrong, I have my moments when I am not the most kid friendly person (only when I need “adult time” or “me” time), but all in all I do love kids. I really like teaching kids because they ultimately teach me something each and every time. These past two Tuesdays have been an example of that. The past two Tuesdays I have volunteered to teach the “Fitness Club” at the Elementary school my boys attend. Well, one is in Middle school now and the other in Preschool, so that leaves one at the Elementary school…as ususal I digress. As I was saying, last week I taught Yoga, and then this week I taught a ZUMBA class. We had fun. Initially, I think the kids were a little apprehensive…a few were giving me a side eyed glance…especially a few of the boys but afterwards all were smiles and all was great. What I loved most was how excited the kids were when they discovered how capable they were of doing stuff. I had the kids do different poses, in yoga, and those pipsqueaks were darn near wrapping their legs around their heads. I loved it! They became excited about yoga and ultimately excited about exercise. They taught me that if I just keeping trying and I let go, I can do it (anything challenging me) too. They taught me that I can laugh and have fun while exercising, even when I feel skeptical about what it is I am doing. I heard from some of the parents that the kids went home and showed their parents some of the poses. That excited me more than anything! We talk about how obese our kids are and how lazy they are and how bad they eat, etc. I tend to feel that it isn’t the kids. It is our responsibility to expose them to what exercise, good food and life has to offer them. We need to exercise more. We need to eat better. As a society, as parents, we need to share the joy and benefits of good health to our kids. There is such a deep joy and pleasure to be had by us when we sow into our kids lives. Showing them how to live fulfilled, free and healthy is the legacy we should leave our kids. What legacy you want to leave them? This week was good. I taught three different yoga classes…well four actually. I realized how much I LOVE yoga and miss taking it and teaching it more often. I teach it just once a week right now. What I enjoyed most was just taking the time to breathe. There is a need for me to do more…I need to breathe. I was reading an article, in my Yoga Journal magazine, about how powerful breath can be. It cleanses us, restores us and has the power to heal. What was most interesting in this article was an analogy. The writer said that like the wind, breath is invisible yet imagine how the wind moves trees. Imagine how powerful the wind is. An invisible force, like our breath…it is is invisible yet powerful. Powerful enough to calm us down. Powerful enough take us from anger to stillness. From a rapid heartbeat to a slower steady heart rate. I personally was having a rough week and breathing each day with my classes helped me put things into perspective. I was alive, I was able to feel all of the emotions yet still stay relaxed and calm for the time being. It was the power of my breath. My goal this weekend and next week is to find my breathe and use it when the stress of the weekly schedule comes up. When the duties of the day begin to envelop me. When the household responsibilities take up all of my personal time..I will find my personal time when I breath. Despite anything that happens I can find the time to inhale in deep, long breaths and exhale it all out. 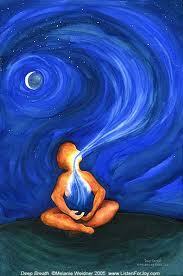 I love to breath, it is my life force. Thank God for breath!